Fire.gov is a collection of resources from the Engineering Laboratory's Fire Research Division at NIST. These Web pages provide links to fire related software, experimental fire data and mpeg/quick time movies of fire tests that can be downloaded and/or viewed with a Web browser. 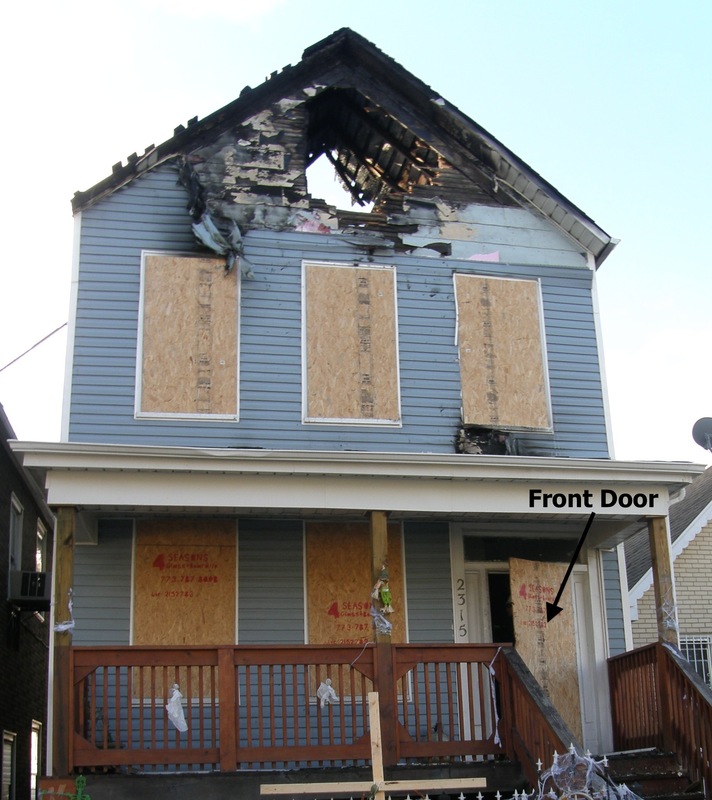 NIST's Fire Dynamics Simulator (FDS) was used to provide insight into the dynamics of a fire within a 2 1⁄2 story single family structure in Chicago, IL, that resulted in the death of a firefighter. The fire started in the attic and spread down through an opening into the enclosed porch on the rear of the structure. This resulted in a ventilation limited (fuel rich) fire condition in the attic and rear porch areas. The spread of fire and hot gases into the second floor of the structure was limited by a closed steel-faced, wood-framed door. After exposure to the elevated temperatures and pressure from the fire in the porch area, the wood frame of the door decomposed and the steel faces of the door failed and door collapsed inward. The door failure resulted in the establishment of a flow path between the higher pressure and higher temperature conditions in the enclosed porch and the lower pressure and lower temperature conditions in the hallway and kitchen areas of the second floor. The temperature of the gases that flowed into the hallway at face height exceeded 260 C (500 F). Unfortunately a captain and firefighter were advancing a hose line in the hallway close to the door at the time of the door failure. The captain was overcome by the rapid change in conditions before he could exit to the safety of the kitchen area. After a Mayday call, the captain was rescued from the structure but later succumbed to his injuries. Tactical considerations on the importance of size-up, flow path control, and exterior attack are provided. Upper images show the front and rear of the structure where the fatal fire occurred. The lower image is a section view of the structure showing the areas of increased temperature on the second floor after the failure of the door between the enclosed porch on the rear of the structure (left side of image) and the hallway. NIST's measurement science research on ventilation and suppression is leading the way to changes in fire-fighting tactics that are improving both the safety and effectiveness of responders. Through collaborations with fire departments and other organizations across the nation, the agency's Fire Fighting Tactics Project effectively delivers practical results of its studies to the fire service. Online course offered by the UL Firefighter Safety Research Institute (FSRI) highlights the tactical application of nearly two decades of research at the National Institute of Standards and Technology(NIST) and UL on how best to fight modern fires. The New York City Fire Department, NIST and UL FSRI set fire to abandoned townhouses on Governors Island, New York, in a series of experiments to examine tactics for controlling fires and rescuing occupants inside burning homes.The focal point of the free course is the results from a series of live fire experiments conducted by NIST, UL and the Fire Department City of New York (FDNY)in 2012 on Governor's Island, New York. Produced by the International Society of Fire Service Instructors (ISFSI), this new training video outlines new tactical operational plans that incorporate the latest fire dynamic research from NIST and Underwriters Laboratory (UL). IFSIS has distilled the new knowledge and lessons learned from this research into SLICE-RS , which stands for stands for Size-up, Location of the fire,Isolate the flow path, Cool from a safe distance, Extinguish and then Rescue andSalvage NIST partnered with ISFSI on developing the video was released at the 2014 International Association of Fire Chiefs Fire Rescue International Conference and is available on the ISFSI website at:www.isfsi.org. Recently, there has been a high level of interaction between fire researchers and the fire service. The objective of the interaction has been to generate research results that can be used to increase the safety and the effectiveness of firefighters. The research demonstrates the changes that fuel loads and construction methods have had on the fire environment within residential structures. These changes have altered the model of fire behavior taught to the fire service for decades. In addition, firefighter protective equipment has also changed over the years. All these factors lead to an assessment that firefighting tactics may need to evolve in order to keep in step with the changing conditions on the fireground. As noted, these findings are the result of research conducted in collaboration with the fire service. To get some insight into this research and the potential applications on the fire ground, a list of web based presentations given by NIST , UL and fire service leaders from across the country are provided with hyperlinks below. The links listed below have been posted within the last year. This is just a partial list of the many free firefighter training resources that are available on the internet. ISFSI Training Modules (DHS/AFG Supported) You have to register but the training is free. This link, learn.isfsi.org will take you to the newly launched ISFSI Online Learning Management System.Several training modules are available including the most recent, ISFSI Single Family Detached Dwelling Fire Tactics Program. As of Sept. 1, 2013, standard firefighter breathing equipment cannot be certified to National Fire Protection Association (NFPA) standards unless the facepiece lenses pass a new rigorous test developed by the National Institute of Standards and Technology (NIST). The 2013 version of NFPA's 1981 standard, published in January, 2013, contains a new "Elevated Temperature Heat and Flame Resistance Test" that exposes the SCBA to 500 °F (260 °C) for 5 minutes in an oven. This test is followed by 10 seconds of direct flame contact. In addition, the new version contains a new "Lens Radiant Heat Test" that subjects the SCBA facepieces to a radiant heat flux of 15 kilowatts per square meter (kW/m2) for five minutes. As part of this test, the facepiece is required to maintain an air supply (positive pressure) inside the mask for a total of 24 minutes. In controlled experiments,** NIST researchers determined that an incident radiant heat flux of 15 kW/m2 would be a representative test criterion for determining the performance of SCBA facepiece lenses. It is representative of the flux experienced by firefighters approaching the onset of the deadly phenomenon known as flashover, a state of total surface involvement in a fire of combustible material within an enclosure. Also, the researchers found that measuring internal facepiece pressure was indicative of when holes formed and the effect of holes on firefighter air-supply duration and breathing protection. The new test and test conditions are important advances in improving the performance of what has been, perhaps, the most vulnerable component of a firefighter's protective gear in high-heat conditions. Failure of a lens can expose a firefighter to toxic gases and can result in burns to the respiratory tract as well as asphyxiation. Documented problems include holes and extensive crazing as well as bubbling and deforming of lenses. In several SCBA-related deaths, degraded masks were found affixed to the faces of victims who suffered thermal burns to their airways. In the United States, SCBA makers submit their products for certification testing before they are sold. Until August 31, 2013, compliance to NFPA standards only requires passing a less severe "heat and flame test," specified in the 2007 version of NFPA 1981 and retained, with the new NIST test, in the recent update. NIST experiments conducted during development of the new facepiece-lens test were supported, in part, by the Department of Homeland Security Science and Technology Directorate and the United States Fire Administration. The National Institute for Occupational Safety and Health (NIOSH) Fire Fighter Fatality and Injury Prevention Program played a critical role in identifying the lens degradation issue. **See the 2012 NIST Tech Beat story "NIST Study of Hazard to Firefighters Leads to Safety Alert" at www.nist.gov/public_affairs/tech-beat/tb20120725.cfm#nfpa. The technical report, Thermal Performance of Self-Contained Breathing Apparatus Facepiece Lenses Exposed to Radiant Heat Flux (NIST Technical Note 1785), Feb. 2013, by A. Putorti, Jr.; A. Mensch; N. Bryner and G. Braga, is available at: www.nist.gov/manuscript-publication-search.cfm?pub_id=912504. Fire researchers from the National Institute of Standards and Technology (NIST) and colleagues from fire service organizations will turn abandoned wood-frame, single-family houses near the site of an old Spartanburg, S.C., textile mill into proving and training grounds for new science-driven fire-fighting techniques this week. The objective of the study is to improve firefighter safety and effectiveness. Experiments conducted in eight different houses will demonstrate fire-fighting methods—individually and in combinations—for strategically ventilating and isolating fires to prevent—or at least delay—flashover, the extremely perilous phenomenon that occurs when heat builds up in a burning structure's contents and components to the point that they burst into flames simultaneously. In conjunction with the experiments, the International Society of Fire Service Instructors (ISFSI) will videotape how firefighters implement size-up, flowpath control, and exterior fire attack, also known as transitional attack. The ISFSI will then develop training modules that will be available to firefighters across the country. Other collaborators in the field experiments include the International Society of Fire Service Instructors, the South Carolina Fire Academy, the Spartanburg Fire Department, the South Carolina State Fire Marshal's Office and the Spartanburg Public Safety Office. The project is funded with a DHS/FEMA Assistance to Firefighters Grant. 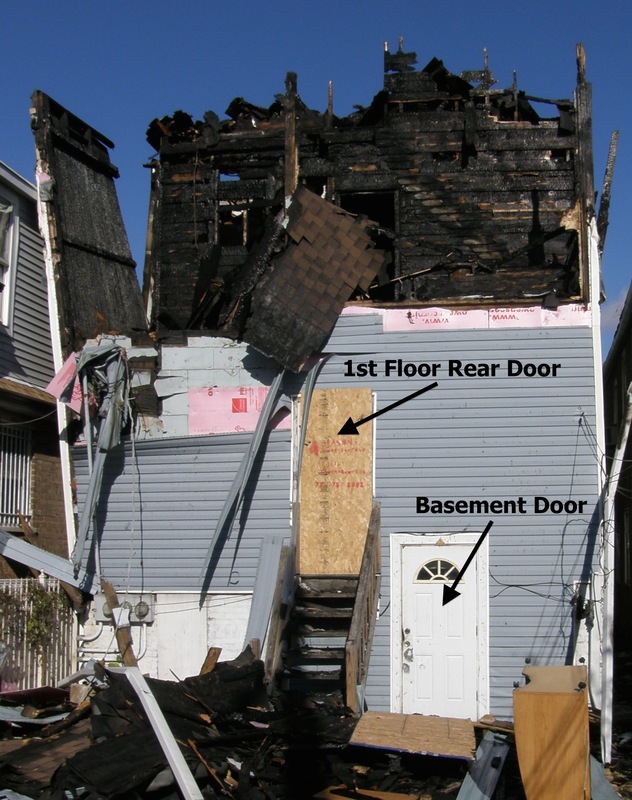 In July 2012, in another team effort, NIST fire researchers gathered data in experimental burns in 20 abandoned townhouses on New York's Governors Island, about a kilometer from the southern tip of Manhattan. The Spartanburg fire tests are being conducted in an area slated for a major redevelopment initiative. These photos show the rapid reduction in heat release rate (fire size) from the application of water from an exterior position from of the "burned side" of the building, when no other vents to the exterior are open. Department, City of New York (FDNY) and Underwriters Laboratory (UL) to examine the different tactics in fighting fires that started on different levels of the structure. Experiments were conducted with fires starting in the basement, in the living room on the first floor, and in a bedroom on the second floor. The objectives of the experiments were to examine different ventilation conditions and how they affect the growth of the fire, and then examine different tactics that the fire department might employ to rescue potential victims that might be in the home and then extinguish the fire.The tactics included additional ventilation, vent, enter, isolate and search (VEIS), and exterior fire attack with manual hose streams. In 2008, NIST conducted a series of wind driven fire experiments with FDNY. The fire experiments took place in a 7 story building on Governors Island. As a result of those experiments, FDNY added several new tools to their fire fighting arsenal and modified their tactics for fires in "fire proof multiple dwelling units." For more information on those experiments and the impact of positive pressure ventilation fans to pressurize the stairs, wind control devices, and highrise nozzles see the wind driven fires section of this website: http://www.nist.gov/fire/wdf.cfm. Exposure to high temperature environments, which firefighters can encounter during fires they are attempting to extinguish, can result in the thermal degradation or melting of a Self- Contained Breathing Apparatus (SCBA) facepiece lens, resulting in elimination of the protection meant for the user's respiratory system and exposing the user to products of combustion and super heated air. Wind blowing into the broken window of a room on fire can turn a "routine room and contents fire" into a floor-to-ceiling firestorm. Historically, this has led to a significant number of firefighter fatalities and injuries, particularly in high-rise buildings where the fire must be fought from the interior of the structure. On April 12, 2009, a fire in a one-story ranch home in Texas claimed the lives of two fire fighters. Sustained high winds occurred during the incident. The winds caused a rapid change in the dynamics of the fire after the failure of a large section of glass in the rear of the house. Wind Driven Fire in Home, Texas, 2009. Aerial view of damage to the structure. Photo credit: Houston Fire Department. NIST performed computer simulations of the fire using the Fire Dynamic Simulator (FDS) and Smokeview, a visualization tool, to provide insight on the fire development and thermal conditions that may have existed in the residence during the fire. Based on the analysis of this fire incident and results from previous studies, adjusting fire fighting tactics to account for wind conditions in structural fire fighting is critical to enhancing the safety and the effectiveness of fire fighters. Previous studies demonstrated that applying water from the exterior, into the upwind side of the structure can have a significant impact on controlling the fire prior to beginning interior operations. It should be made clear that in a wind-driven fire, it is most important to use the wind to your advantage and attack the fire from the upwind side of the structure, especially if the upwind side is the burned side. Interior operations need to be aware of potentially rapidly changing conditions. For more information, including simulation video, see the Wind Driven Fires page. Fire fighters are exposed to highly variable environments including elevated temperatures and convective and radiant thermal flux, which can put a significant burden on personal protective equipment. Thermally degraded and melted self-contained breathing apparatus (SCBA) facepieces have been identified as a contributing factor in certain fire fighter fatalities and injuries in the United States. 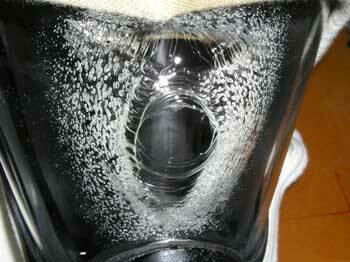 The SCBA facepiece lens is often considered the weakest component of a fire fighter's ensemble in high heat conditions. NIST conducted experiments (with the support of the Chicago Fire Department, the Department of Homeland Security, and the U.S. Fire Administration) which demonstrated a range of realistic thermal exposures and environmental conditions that firefighters could be exposed to. The environments that caused the failures were identified in an attempt to characterize the thermal performance of SCBA facepieces. For more, see the Personal Protective Equipment page.